RS Components (RS), the trading brand of Electrocomponents plc (LSE:ECM), a global multi-channel distributor, has introduced the Amphenol ICC BergStak® Lite 0.8 mm vertical mating PCB-to-PCB connector system. 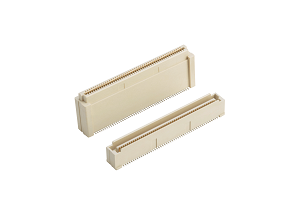 An economical yet versatile connector range with a multiplicity of configuration options, BergStak Lite is particularly well suited to high-speed, high-density parallel board stacking applications in IP phones, measurement equipment, point-of-sale (POS) terminals, portable industrial terminals, security systems and test equipment. The Amphenol BergStak® Lite system includes straight PCB headers and sockets with a choice of 40, 60, 80 or 100 contact positions arranged at 0.8 mm pitch in one to four rows. A choice of 16 PCB stacking heights is available, in 1 mm increments from 5 mm to 20 mm. Design engineers are thus provided with a consistent mating interface across a wide variety of formats to support evolving designs and mechanical requirements. Depending on stack height, BergStak® Lite can support data rates of up to 12 Gbit/s — compatible with PCIe version 3 and SAS 3.0 high-speed bus performance. The 0.8 mm contact pitch conserves PCB space for high-density applications. Economical gold flash plating on the contact areas supports 50 mating cycles, while a scoop-proof housing prevents terminal damage due to reverse mating. Optional PCB locator pegs help ensure easy, accurate manual assembly. BergStak Lite has an operating temperature range from –40°C to +125°C and is available in a UL94 V-0 rated flame retardant LCP (liquid crystal polymer) material. It is RoHS compliant and lead free. RS offers packaging options for BergStak® Lite ranging from small packs to tape-and-reel for full-scale manufacture. The Amphenol BergStak® Lite system is shipping now from RS in the EMEA and Asia Pacific regions. RS Components and Allied Electronics & Automation are the trading brands of Electrocomponents plc, a global multi-channel distributor. We offer more than 500,000 industrial and electronics products, sourced from over 2,500 leading suppliers, and provide a wide range of value-added services to over one million customers. With operations in 32 countries, we ship more than 50,000 parcels a day.